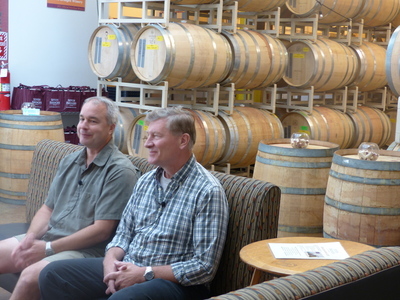 Bob Switzer and Jim Straus are photographed during an oral history interview at Seven Bridges Winery in Portland, Oregon on July 25, 2016. Switzer and Straus were interviewed by Linfield College archivist Rachael Cristine Woody. Bob Switzer and Jim Straus are the owners and winemakers at Seven Bridges Winery. Linfield College Archives, "Bob Switzer and Jim Straus Interview 11" (2016). Browse All Portland Urban Wineries Oral History Interview Photos. Image. Submission 2.